Sir Alex Ferguson (left) and Steve Evans shake hands after an FA Cup tie at Old Trafford in 2011. Peterborough United manager Steve Evans has never been on the wrong end of an FA Cup shock. Indeed Evans’ own experiences of the greatest knockout competition of them all are very positive. Crawley boss Steve Evans during a famous FA Cup win over Derby in 2011. Evans guided Crawley to the fifth round in successive seasons in 2011 and 2012. On the first occasion Crawley were a non-league club when they bowed out in front of almost 75,000 against Manchester United at Old Trafford. 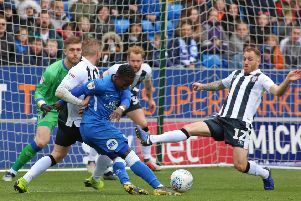 They had beaten Derby County 2-1 in a previous round thanks to a last-minute goal from former Posh player Sergio Torres. “That’s what can happen in the FA Cup which is why we all want a great run this season,” Evans stated. “I’ve been very fortunate in my career to have mainly positive experiences from the competition. Peter Crouch celebrates a goal for Stoke at Crawley in a 2012 FA cup tie. “The runs with Crawley were magical. Beating Derby was good enough when we were a non-league team, but to get a fifth round tie at Old Trafford was the stuff of dreams. “And we only lost 1-0. Anything can happen in the FA Cup. We came close to taking mighty United to a replay which would have made an already fantastic achievement even better. “Sir Alex Ferguson was very complimentary afterwards and he was also very relieved. “The following season we were in League Two and we reached the fifth round before losing at home to Stoke when they were a top 10 Premier League side and Peter Crouch scored one of the goals. “They are days players never forget. It’s what I will be drumming into the players before Saturday’s game. It’s what we must aim for. “Travelling to Bromley is not glamorous for us, but it’s a huge game for them. If we approach the game like we did at Wycombe last weekend we will be in trouble again. “I know from my own experiences that non-league teams love these occasions. “Bromley will be highly motivated and we will need to match that for our superior ability to become decisive. “Put simply if our attitude is spot on we will win, but if it isn’t we will get beaten. “Shocks happen every season and we must make sure we are not among them. For once we don’t want any headlines this weekend. “I’ve lost to teams lower than my own before, but they’ve never been as big a shock as Posh losing at Bromley would be. “The FA Cup is important. I want to win every game obviously, but there is something special about reaching the third round and waiting to see if you land a big draw. “And going well in the FA Cup doesn’t necessarily impact badly on your chances in the league. “Crawley were promoted in both seasons we reached the fifth round.